Born and raised in California, Dr. Joseph Morcos earned his Bachelor of Science degree in Biological Sciences from the University of California Irvine. He then went on to the prestigious Herman Ostrow School of Dentistry of the University of Southern California to earn his Doctoral of Dental Surgery (DDS). Morcos continued his impressive educational career by obtaining a Master's degree in Oral Biology and a Certificate of Advanced Graduate Studies in Periodontology from Boston's Henry M. Goldman School of Dental Medicine. Specializing in periodontics, Dr. Morcos has dedicated his career to making sure his patients are receiving the best care possible. He believes that every patient should be treated like a family member. As a Board Certified Periodontist, Dr. Morcos has reached the highest level awarded to those in the field of Periodontology. Schedule an appointment with Dr. Morcos to see why he is one of the highest rated periodontists in Southern California. When Dr. Morcos is not busy providing care to his patients, he can be found with his family and twin daughters. "This appointment was to see a periodontist for the first time. I really appreciate being referred to another doctor and visiting my regular office with the amazing office staff! 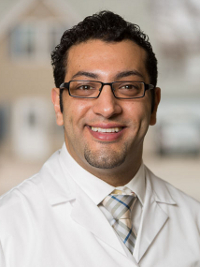 Dr Barsoum has the utmost care for his patients, even when they are referred to a specialist. Thank you!" Periodontal disease, more commonly known as gum disease, has the potential to create a wide range of oral health problems. If left unchecked, gum disease could potentially lead to the loss of some or all of your teeth, and a periodontist is your best bet in preventing this from happening. Periodontists are dental specialists that focus specifically on diagnosing, preventing and treating periodontal disease. In addition, periodontists also specialize in treating oral inflammation and performing dental implants. Properly treating periodontal disease can be incredibly complex, which is why all periodontists go through an additional three years of specialized training following dental school to ensure that they are up-to-date with all of the latest techniques and procedures for treating gum disease and for performing various cosmetic dental procedures. At Barsoum Dental's Chino and Upland locations, our periodontist offers a wide range of treatments to help you overcome any periodontal problem. Scaling and root planing or root surface debridement are two options that can help to eliminate root infections and thus potentially save you from needing to have your tooth extracted. Our expert team also offers a range of surgical options for treating severe periodontal disease and gum problems, and we can also assist you in improving the health and appearance of your smile through numerous dental implant procedures. When you schedule an appointment to visit Barsoum Dental, our periodontist will first examine your medical history and perform a thorough examination of your teeth and gums. In this way, we can ensure that we understand your case fully and determine a plan of action that gives you the best chance of fully overcoming your periodontal issues. Whether your gums are receding, your teeth are becoming loose or you’re in need of dental implants, our staff will make sure that you fully understand all of your options.